A pair of goals just two minutes apart in the final 25 minutes led SMU to a 2-0 victory Wednesday night over the NIU men’s soccer team at Westcott Field. Mauro Cichero found the net in the 69th minute and Idrissa Camara tallied in the 71st to lead the Mustangs to the victory. 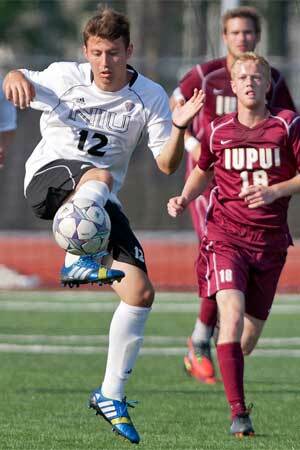 “I thought the first half was a really bad half of soccer,” said NIU head coach Eric Luzzi. “So I was pleased that the guys were able to turn it around in the second half. We came out well (in the second half); we started on the front foot. We were dangerous, we almost got in once or twice, and then, credit to SMU, they scored two pretty good goals. 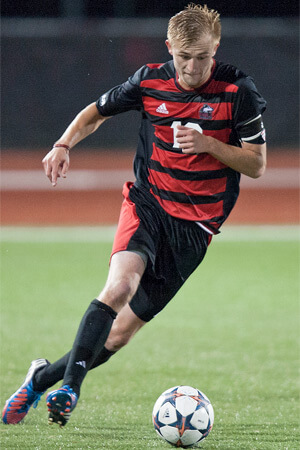 SMU (5-3-0) had a chance to open the scoring in the ninth minute as Garrett Welch hit the crossbar. Off a corner kick, the initial header fell into a group near the six-yard box where Welch was able to get the shot but it came back off the bar. In the 17th minute, NIU redshirt junior goalkeeper Andrew Glaeser (Walla Walla, Wash./Walla Walla) was called into action for the first time. SMU’s Bryce Clark stepped up to a free kick from well outside the box and forced Glaeser to tip the shot over the bar for a corner kick. The Huskies would clear the resulting corner. NIU (2-4-3) found more possession of the ball midway through the first half as both senior Isaac Kannah (Plymouth, Minn./Prairie Seeds Academy) and junior Charlie Oliver (Crystal Lake, Ill./Crystal Lake South) created opportunities but were unable to get shots on goal. The Mustangs had two more chances in the opening 45 minutes as Cichero saw his header off a free kick go wide in the 32nd minute and Damian Rosales shot wide of the post in the 36th as the contest went to the intermission scoreless. NIU created the first real chance of the second half after earning a free kick wide of the Mustang goal. Senior Jayson LeSeth (Des Plaines, Ill./Maine West) whipped the free kick in near the six-yard box and senior Dusty Page (Germantown, Wis./Kettle Moraine Lutheran) was first to it in the air, heading just wide in the 57th minute. The Huskies had much more of the ball after the break but SMU scored first, against the run of play in the 69th minute. Cichero had the first shot, which came back off the post and Abdul Yassine was first to pounce on the rebound, giving the Mustangs a 1-0 lead. SMU doubled its lead just two minutes later. Clark played the ball to Camara inside the six-yard box and Camara made no mistake, powering a shot past Glaeser to give the Mustangs a 2-0 lead. In the 80th minute, Glaeser made an outstanding save on a header by Camara. A cross came in from Glaeser’s left to an unmarked Camara and the Walla Walla, Wash., native made an outstanding reaction stop. Glaeser finished the contest with three saves. NIU will return to action on Saturday, Oct. 4, as it concludes a three-game road trip with a contest at Loyola-Chicago. Game time against the Ramblers is slated for 7 p.m.